I have never experienced the effects of pure joy and happiness as I feel when practicing Girish Jha classes. Through a regular practice of Girish’s unique program, I have been able to cope with and manage my diabetes to a far greater extent than I had in the past, all while enjoying a calm and peace and happiness within my daily life. In fact, his teachings have helped me to look at my disease as an opportunity to learn about myself. Dear Girish Jha, Since I received your teachings in Jakarta from 1997 until 2000 I can say that my perception of life has changed. With your teachings, I rediscovered the Serenity and Inner Peace. Secondly, the smile. Smile, no matter how big your problems seem to be. Keep smiling. Even when I feel more stressed I try to bring the smile to my face, and it is really a big asset. Life is a learning process that gives me every day a way to be more capable, more focused, more energetic, more serene. My first interaction with Girish Jha took place in 2008, when he was giving a small and easy practice of conscious rest and relaxation. For years, depression caused too much of pain in my life. Later, I started weekly specialized and personalized session with Girish Jha. After a year, I realized that how powerful the practices are, that can help cope and manage with depression, anxiety, pain and grief. His uniqueness lies in his personalization of weekly sessions that helps induce deep calm, peace and silence within. 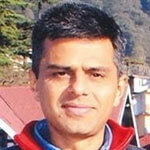 Girish Jha is the best Nada Yoga and Meditation teacher I have ever had. He is very knowledgeable and very good at teaching the subjects of Nada Yoga and Meditation. He gave me many examples on how to apply the information into my daily life. I am very grateful to have him as my teacher. If you ever get a chance to take his classes I highly recommend attending. Girish was called at Army Cantonment at Leh in Himalayas for a training for Officers and their families and troops. I was the Army officer in General Staff to coordinate this training. I must say this that the feedback collected after training of 187 officers and about 1000 odd troops in various camps was encouraging. …….. were found to be very refreshing and stress relieving and troops could produce more work and output. Army has expressed its gratitude to Girish ji …….